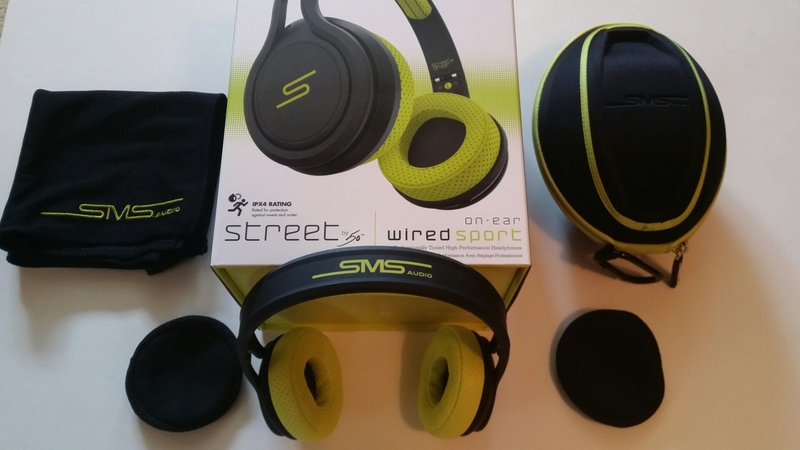 In January 2014 SMS Audio (Studio Mastered Sound), 50 Cent’s personal brand of headphones announced an addition to their product line called ‘STREET by 50 On-Ear Wired Sport Headphone’. This is the sports edition to their already existing STREET by 50™ line up of headphones. This article is a full product review on these headphones which will focus on 3 key areas: Design, durability and sound quality. Whether you are an average consumer or a serious audiophile this review is for you. When you see the packaging you’ll immediately like it. The box itself is stylish and includes images of 50 Cent, Carmelo Anthony and the headphones itself. 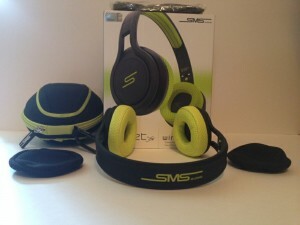 When you physically open the box you will notice there is a hard shell carrying case, ear cups and a sports towel with the SMS logo. The headphones are inside the carrying case. When you feel these headphones you will be pleasantly surprised. They are unlike any headphones you’ve seen or felt. They feel like a premium product in your hand. It is compact meaning it fits perfectly in the hand and due to its small size it is portable. They are very stylish and can be worn with your everyday attire. They are available in 3 colours, Sport Blue, Sport Yellow and Sport Pink. A wireless version is also available. I myself purchased the wired yellow pair (the blue ones were sold out). There will be additional colours available in the fall of 2014. The ear cups themselves are interestingly designed. The material is made of leather and memory foam. Their design is fairly similar to those of NBA jerseys but they look good with it. Unlike most traditional headphones, they have oval shape ear cups which not only fits your ears better but they are comfortable for a long period of time. The headband of these headphones has rubberized coating which not only makes it durable, but it is finger print resistant and gives it a constant clean look. Overall these headphones were meticulously designed and if you’re someone who is big on design these headphones are a great choice. 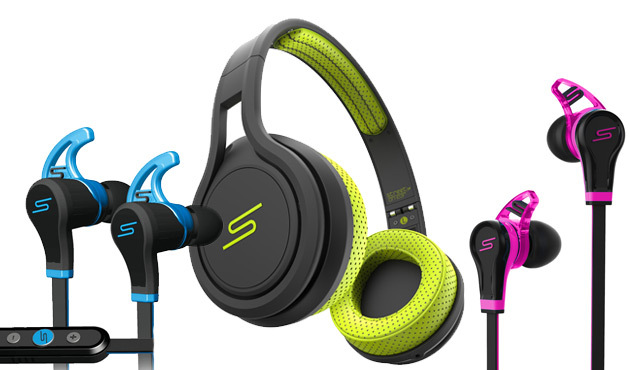 SMS Audio separates itself from the competition because of their durability and these headphones are no exception. If you’re someone who lives an active lifestyle and likes to go to the gym, play sports, enjoys running and anything else involving physical activity, these headphones are for you. 50 Cent is known to be a fitness enthusiast so these particular headphones are a direct extension of that. They have a IPX4 rating which means it gives you full protection against sweat and water. The headphones themselves are made with a rubberized coating which prevents it from scratching and chipping. If you’re someone who does not exercise and just need a pair of headphones for your daily commute to school or work, these are ideal as well. It is portable and easy to carry around with you. Also, the carrying case is a hardshell which means sticking it in your bag or purse won’t cause any damage to it and even dropping it won’t be a problem. These headphones were designed to be compatible for your everyday life and its durability is reflective of that. To some this might be the most important section. The sound quality on the STREET by 50 On-Ear Wired Sport Headphone are incredible. If you’re just an average consumer who wants to be able to listen to your music crystal clear then these are the right pair for you. The headphones give you great clarity while also giving you a good balance of bass. It does place an emphasis on bass, but it does not compromise the clarity of your music. It does a great job of drowning out outside noise which is ideal if you will be working out in the gym or commuting. If you are someone who is an audiophile and you really care about how music sounds through your headphones then you will be pleasantly surprised by these. SMS Audio was made for both the average consumer and music enthusiasts as well. The only improvement I would like to see is on the sound leakage. I personally listen to my music at 70-75%, and at those levels it can be heard from those on the outside. Personally I find this to be a bit annoying and other users may feel the same way. However that is not significant enough to not be using or purchasing it. All in all the sound quality of these headphones are excellent. If you’re in Canada or the United Kingdom you have to order them online. However I ordered my pair on July 14th and received it on July 17th so I wouldn’t expect long waiting times. If you’re in the United States you can pick up a pair online or at any authorized reseller such as Best Buy or Walmart. To conclude this review, SMS Audio has put together a number one hit.